The 3703 ChargeWorks EV Charger from Electric Vehicle Supply Equipment (EVSE) LLC is a competitively priced, Smart-Grid-ready electric vehicle charging unit that offers a wide range of installation options. Economical: The charger’s smart, yet streamlined design supports a cost-effective price-point. Smart-Grid Ready: EV chargers from EVSE support efficient transmission of electricity to promote a low rate structure for customers. Mounting Flexibilities: The 3703 ChargeWorks EV Charger is configurable as a single wall or single/dual pole-mounted electric car charger. Scalable: ChargeWorks’ modular design can provide network support for up to 32 3703s with a single Payment Module. The 3703 electric vehicle (EV) charger provides Level 2 (208-240VAC up to 30A) charging and simulated Level 1 charging (208-240VAC up to 7A). 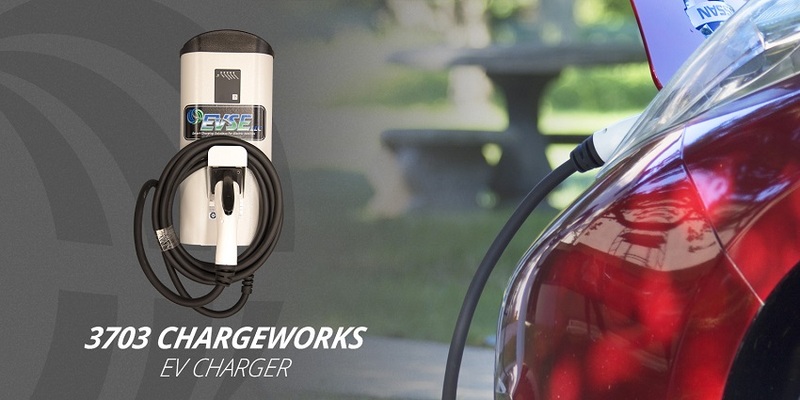 The ChargeWorks EV Charger, like all EVSE LLC chargers, can operate standalone or on network. It meets Open Charge Point Protocol (OCPP) standards to ensure the system is accessible to all EV motorists. The unit has been engineered for either exterior curbside pole installation (single or dual) or wall mounting. The 3703 meets or exceeds all NEMA 3R specifications. EVSE’s ChargeWorks EV Charger accepts Automated Demand Response throttling commands that allow pricing and power to be controlled during peak demand. Additionally, the 3703 can be controlled remotely, which enables power to be applied, reduced or disconnected remotely. The system continuously measures voltage and current being supplied to the EV. The charger’s five status lights indicate the progress of the charging operation. When not in use, the ChargeWorks’ 5.8-meter (19-foot) charging cable (longer lengths are available) wraps around the unit’s storage hook and the connector stores in a holster. An optional cable retraction feature that keeps cables off the ground is also available. EVSE’s 3703 ChargeWorks can be activated by mobile phone app ­or by credit card/RFID card on the supporting payment module. The 3703 communicates directly with a Payment or Gateway Module and integrates with leading parking payment system providers. Serial or Zigbee connections are available for facilitating communication between the 3703 and Payment Module. A serial connection can be established between one or more ChargeWorks EV Chargers and an EVSE Payment Module. A single serial Payment Module can support from one to eight ChargeWorks EV Chargers. A single ZigBee Payment or Gateway Module can support up to 32 remote 3703s.